The Team of Jane Meterparel & Brian Marvelley are "Always available and extremely flexible." The Team of Jane Meterparel & Brian Marvelley assisted their Buyers in purchasing this beautiful Garrison style home in Wellesley. Their expert negotiation skills were able to secure a purchase price under asking. Thinking of making a move? 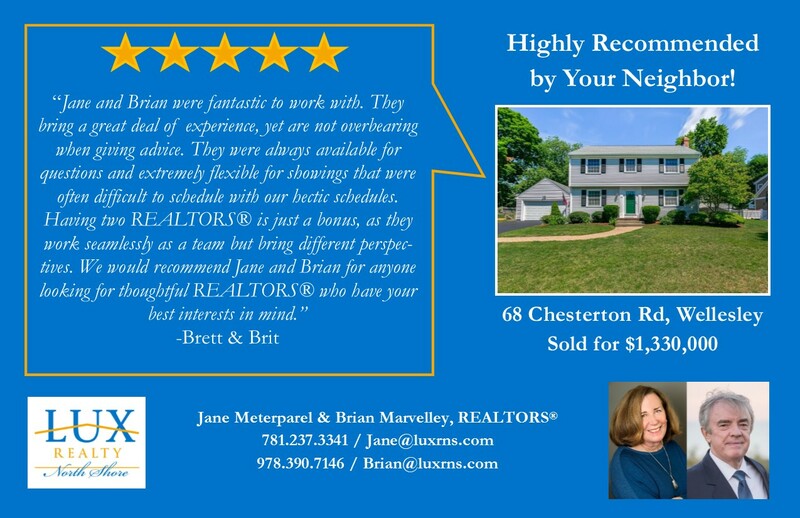 For exceptional service make sure to call Jane & Brian! 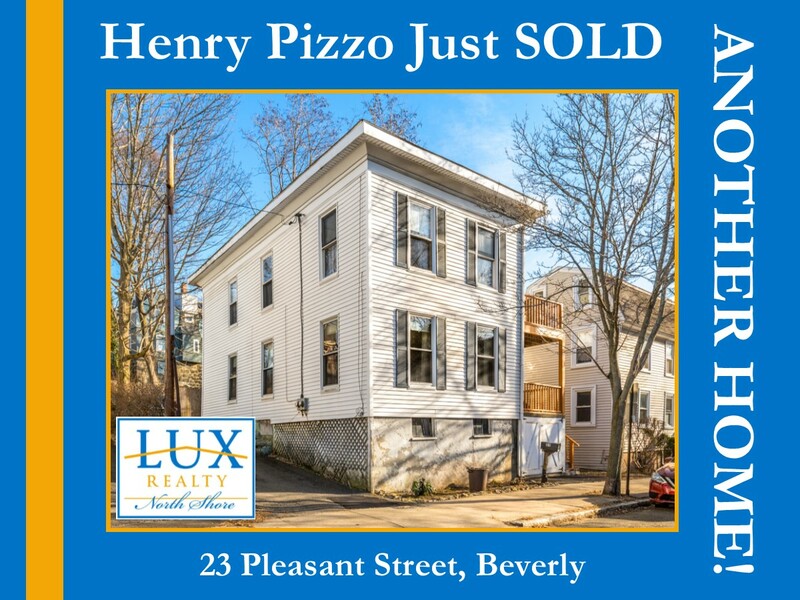 Another Beverly home SOLD by LUX Realty North Shore! Listed by Henry Pizzo of The Pizzo Johanson Team, this North Beverly Ranch style home is nestled on a side street. Henry was able to negotiate a purchase price under his suggested listed price. Cute as a button, this move-in ready home offered 2 beds/1.5 baths, a spacious eat-in kitchen, formal living room with bay window and wood burning fireplace. The newer media room addition is a great space for unwinding. When it comes to selling a Beverly property, Henry Pizzo has a track record that speaks for itself so call him today. 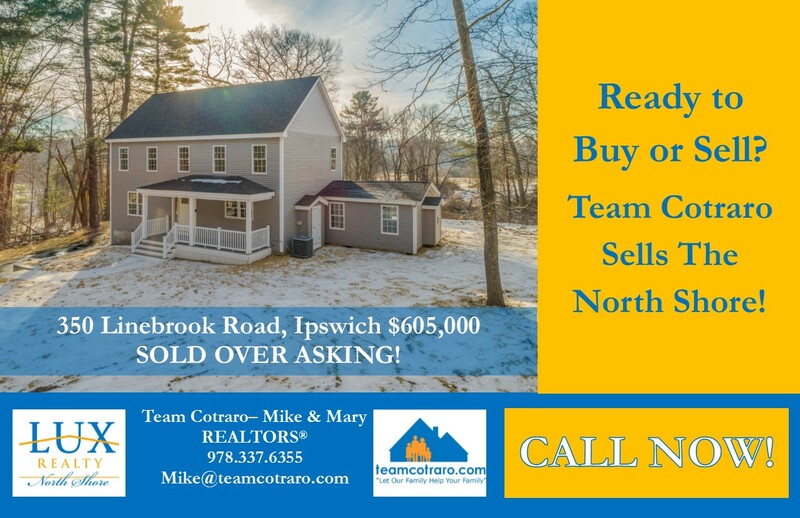 Ipswich Colonial Listed by Team Cotraro Breaks Price! Listed by Team Cotraro, 350 Linebrook Road, Ipswich is a handsome Colonial that was thoughtfully renovated and updated for today's lifestyle. The Seller of this fine home received an offer in just 2 days of being on the market and SOLD their home for over asking! The Spring Real Estate Market is here, whether buying or selling, Team Cotraro is here to help you with all of our real estate goals! This sunny home offers 3 beds, 2 full and 2 half baths and a welcoming floor plan that is perfect for hosting gatherings! The open concept first floor features a fabulous kitchen that opens to the formal living room. French doors lead from the living room to the formal dining room. The spacious sunken family room with fireplace has access to the patio area and backyard. Upstairs is a true master suite with an 8x7 walk-in closet and gorgeous en suite with double vanity. Two other generous bedrooms and another full bath round out the upper level. The partially finished basement provides a great bonus space for a game/media room or a home gym. 68 Haverhill Street, Rowley SOLD over asking! Privately set on a wooded lot in Rowley, 68 Haverhill Street, was listed by Henry Pizzo of The Pizzo Johanson Team. The Sellers of this 3 beds/2 baths Ranch home received multiple offers and SOLD their home for over asking! If your thinking of selling your property on the North Shore call Henry and let his expertise help you reach your goal of Selling! It doesn't get any more affordable than this! 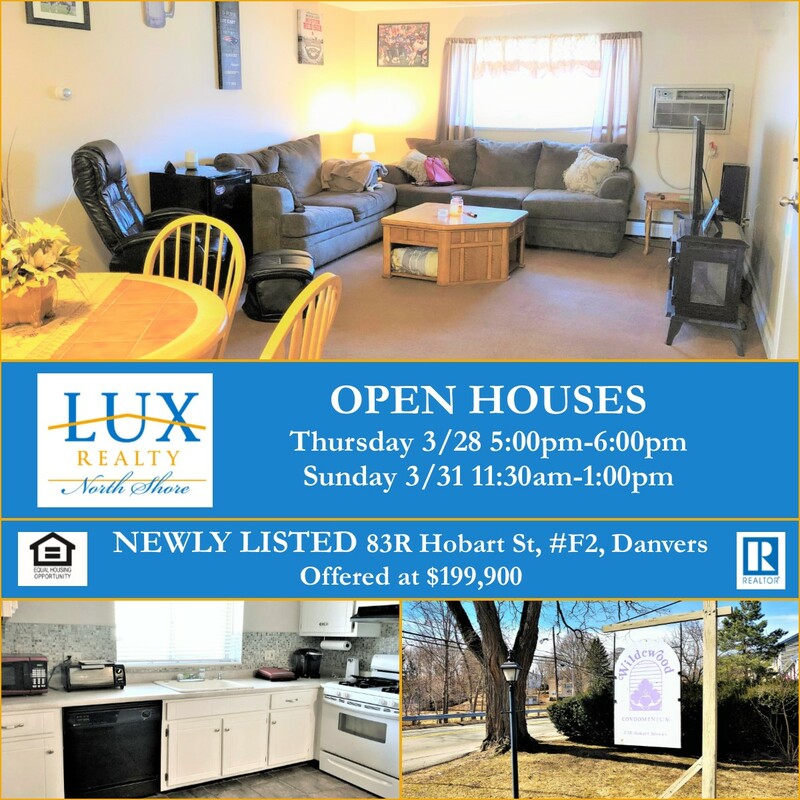 Just Listed by Betsy Woods, 83R Hobart Street, #F-2 is a cozy garden style condominium tucked away, yet close to the Danvers Rail Trail, restaurants, and major commuter routes. Offering an open concept living room/dining area and kitchen with updated slate flooring and tile backsplash, a spacious master, a second good sized bedroom and an updated bath. Low condo fee with HEAT & HOT WATER included! Why rent when you can own? This great home will be open this Thursday, 3/28 from 5:00pm-6:00pm and Sunday, 3/31 from 11:30am-1:00pm. 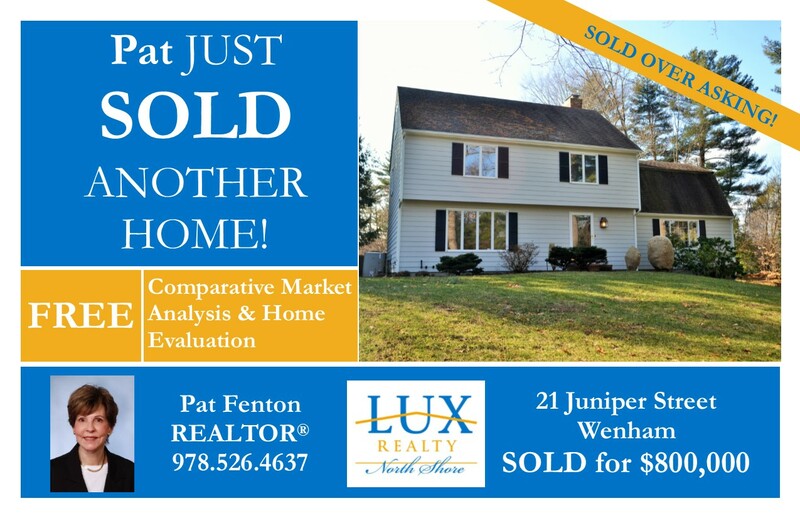 Wenham Colonial, listed by LUX REALTOR® Pat Fenton, SOLD over asking! 21 Juniper Street, a stately Colonial set on a private lot in Wenham was listed by Pat Fenton. Pat's Sellers accepted an offer in just 1 day of being on the market and SOLD their home over asking! This spacious home offers 4 beds, 2 full and 1 half baths and a classic floor plan that is perfect for today's lifestyle. The sunny eat-in kitchen is accented with a double sided fireplace and French doors that lead to a sunken enclosed porch. The formal living, dining room and the family room all have hardwood floors. Upstairs is a true master "retreat" with a luxurious en suite, fireplace, and double closets. Three other generous bedrooms and full bath round out the upper level. The backyard offers a great space to entertain with a level yard, patio, and in-ground pool. Thinking of making a move? Give Pat a call and let her proven track record of selling homes quickly and for top dollar work for you! If you are thinking of Selling or Buying an investment property in Beverly, call Henry Pizzo of The Pizzo Johanson Team today! 23 Pleasant Street, a 2-unit property is located in the heart of downtown Beverly. 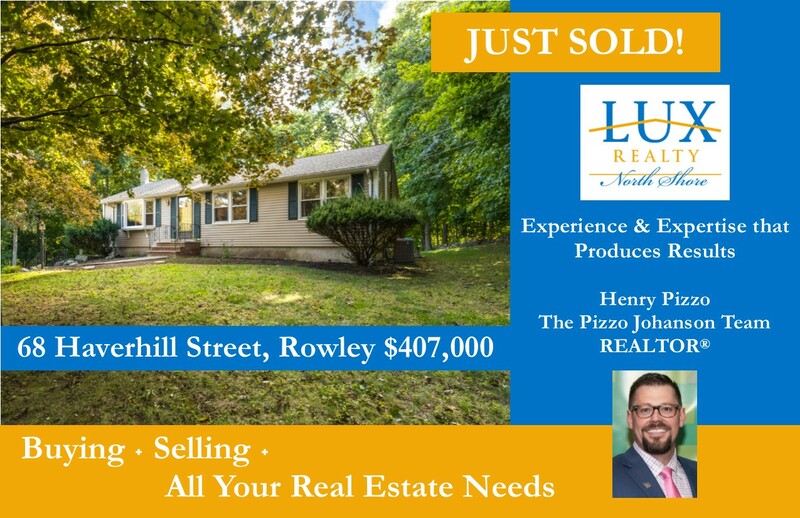 Listed by Henry, the Sellers of this property SOLD their home for $390,000 that's just $9,000 under asking! The first-floor level offered 2 beds, 1 bath, and a porch. The upstairs unit offered 3 bedrooms, 1 full bath, and a deck. With some sweat equity, this home will shine! Please click on the photo for property details of 23 Pleasant Street.